Description: This branch line leaves the Cambridge mainline soon after Broxbourne and goes west along the Ware valley to Hertford. 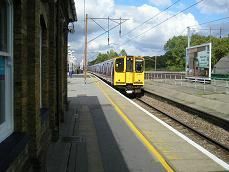 Description: The line leaves the main Liverpool Street to Cambridge line soon after Clapton, before cutting across hackney marshes before passing through the town of Walthamstow. It finally ends at Chingford just before the Greater London border reaches Essex. 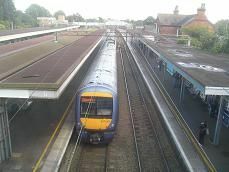 Trivia: This route used to have the nickname of "The Jazz Service"
Description: This branch line off the Great Eastern mainline first passes right through the centre of the ancient town of Colchester before going eastwards to the North Sea coast. 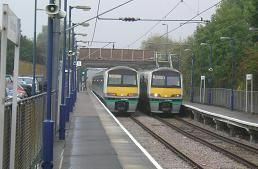 At Thorpe-le-Soken the line splits in two, with one branch going to the large seaside town of Clacton-on-Sea, whilst the other branch goes to the more sedate Walton-on-the-Naze. 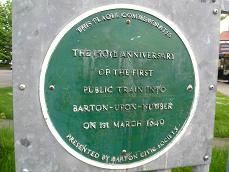 History: The railway to Clacton was first opened in 1882. The line was first electrified in 1959 but not completed all the way to London (70 miles away) until 1962. 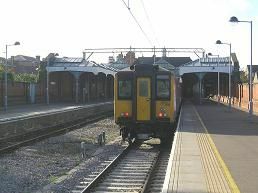 Trivia: Colchester Town station was originally called "St Boltophs" after the church next to the station. Description: This branch line goes in a north westerly direction from Darlington to Bishop Auckland on the eastern edge of the Pennines. 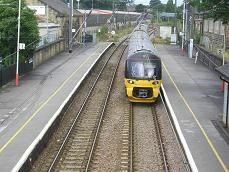 It passes through Shildon where the "Locomotion" museum is situated. History: This branch line forms part of the original Stockton and Darlington railway line which was opened in 1825. At first freight trains went from Stockton-on-Tees to Witton Park Colliery near Shildon. In 1833 regular passenger trains first travelled on the route. 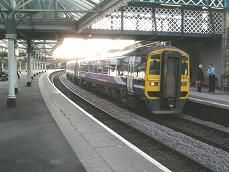 The section north to Bishop Auckland was opened in 1843. Then by 1895 the line had reached beyond Bishop Auckland up the Wer Valley to Eastgate. 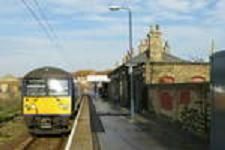 In the early 1900's the line was electrified between Shildon and Newton Aycliff, though by 1933 the electrification was ended. The beeching cuts of the 1960's swa many lines in this area closed to passenger traffic, though the section between Darlington and Bishop Auckland was saved. 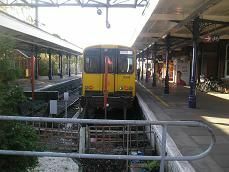 Description: This short branch off the main line to Cambridge out of Liverpool Street has just one station on its branch at Bush Hill Park. 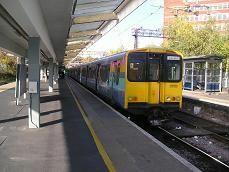 Description: This busy commuter branch leaves the East Coast mainline at Finsbury Park and apart from a short open-air stretch to Drayton Park is underground for most of its route. It changes from using overhead power to third rail at Drayton Park. 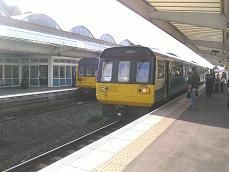 Description: This branch line leaves the main Cleethorpes to Barnetby line at Habrough and goes north to New Holland and then west to Barton-on-Humber, where there is a bus connection to Hull via the Humber Bridge. History: The line was first opened in 1849 as part of the Great Central Railway. 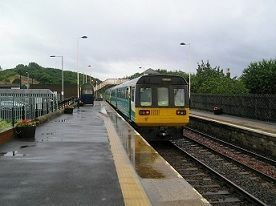 In 2007 the line was designated as a community rail line by the Department of Transport. 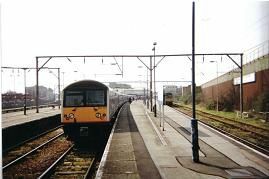 Description; The line runs roughly north from the port of Hull in the south through the East Yorkshire Wolds and along coast to the seaside resort of Scarborough in the north. 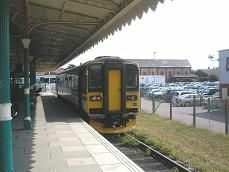 History: The line was the brainchild of Colonel George Tomline, a local landowner, whose Felixstowe Railway and Pier Company, opened its line from Westerfield to Felixstowe Pier in May 1877. In 1887 the Great Eastern Railway absorbed the line and built an extension to Felixstowe Town in 1898. In the first half of the twentieth century the line became popular with hoildaymakers, with summer specials from the Midlands and London. From the 1960's on Felixstowe docks grew rapidly as a result of the container revolution, increasing freight traffic on ther line. there are plans to double the line due to the amount of traffic on the line. Description: The line goes almost in a circle round Ipswich before leaving the Suffolk line at Westefield and going South Eastwards along a busy single track line to Felixstowe Town, past the massive container port on the right. Description - This picturesque line travels north-east through the east Suffolk countryside passing through several quaint market towns before it crosses into Norfork and moves east to the coast at Lowestoft. 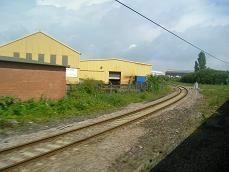 Description: This is just one of many minor lines to the south of Leeds in a former mining area. 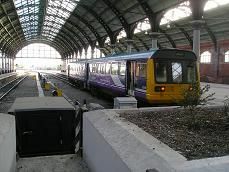 Description: This picturesque line runs northwestwards friom Leeds out into the Yorkshire Dales. 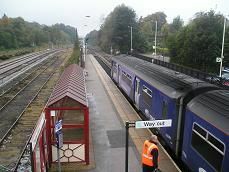 History: The line to Ilkley was first opened in 1865. It was electrified in 1995. 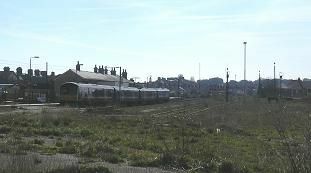 Description: This branch line leaves the Great Eastern mainline to Norwich at Manningtree where it follows the southern edge of the River Stour estuary until it comes to Parkeston Quay Docks. 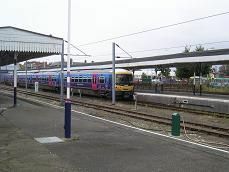 It then continues along the coast into Harwich Town where the line terminates. History: Railway first opened in 1854. Then in 1879 the Great Eastern Railway began to reclaim land to the west of the town which eventually became Parkeston Quay and succeeded in overtaking nearby Ipswich as the main port for sailing to Holland from. In 1925 the LNER started a train ferry service from Harwich to the Hook of Holland, carrying mainly perishable goods trains. In 1968 a container port was opened at Harwich. 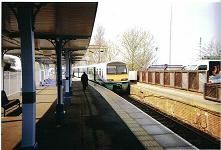 In 1986 the line was finally electrified from Manningtree to Harwich Town. 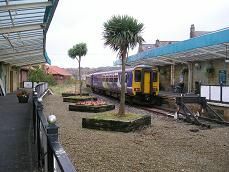 Trivia: Maningtree station has the reputation as being one of the windiest railway stations in the whole of Britain! 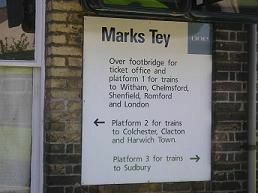 Description: This branch line goes from Mark's Tey in Essex, on the Great Eastern Main Line to Sudbury in Suffolk, a market town famous as being the birthplace of artist Thomas Gainsborough. It passes through the valley of the River Stour in some of England's most beautiful countryside. Much of this area was painted by the artist John Constable. 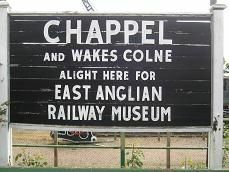 Chappel and Wakes Colne station is the home of the East Anglian Railway Museum and the station here is a recreation of a 1930's rural station. 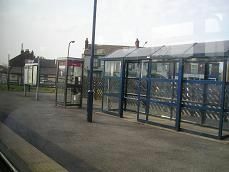 Trivia: The footbridge at Chappel and Wakes Colne station was originally the one at Sudbury station. 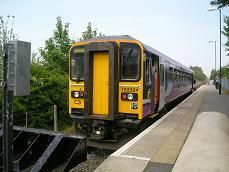 Description: The line moves eastwards from the heavily industrialised landscape around Middlesbrough towards the North Sea coastline and the seaside town of Saltburn. 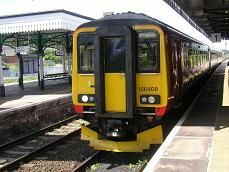 Description: From the industrial scenery of Teeside, through the North York Moors to the North Sea Coast at Whitby, this fascinating branchline has it all. Steam trains of the North York Moors railway now run right through to Whitby from Pickering, joining the line at Grosmont in the summer months. History: The eastern section of the branch was the first to be opened. This was the Whitby & Pickering Railway which opened as early as 1836. The next section of this branch, between Middlesbrough and Nunthorpe was opened in 1854, as part of the Middlesbrough & Guisborough Railway. Then in 1865 the North Yorkshire & Cleveland Railway opened the section of line between Battersby and Grossmont. The final section between Nunthorpe and Battersby was opned in 1868. 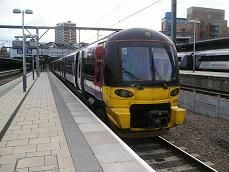 Description: This line goes right across the "top" of England through the Pennine Hills, from Newcastle to Carlisle, following the valley of the river Tyne for much of its route. 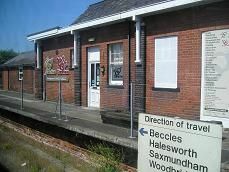 Description: This community railway line travels north from Norwich, through the North Norfolk countryside where the Norfolk Broads are situated, before reaching the coast at Cromer. The train reverses here and then runs westward along the coast to Sheringham where it terminates next to the North Norfolk Railway. History: The line was opened on 1st May 1844, having been engineered by George and Robert Stephenson. This was the very first railway line from Norwich to anywhere else in Norfolk. 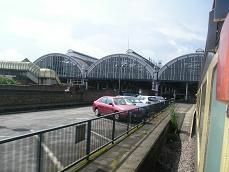 (Norwich wasn't actually connected to London by rail until 1845 and only then via Cambridge). The original line wasn't the most direct and had to go north east from Reedham across the marshes. The owner would only allow a railway to cross his land on condition that a station had to be built in the middle of the marshes for trains to stop daily there in perpetuity. 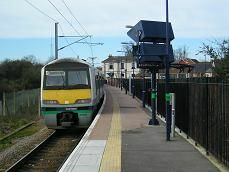 This station is Berney Arms and has no road connection to it, but trains do stop there on request every day. 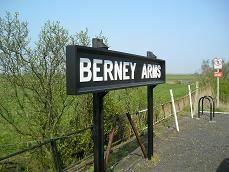 Trivia: Berney Arms station is believed to be the only station in England which cannot be reached by road. 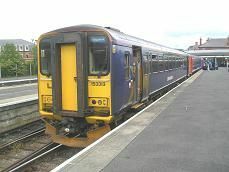 Description: The line goes in an easterly direction from Norwich across some very flat land, before it leaves the Yarmouth line at Reedham and moves in a south easterly direction where it reaches the Suffolk coast at Lowestoft. 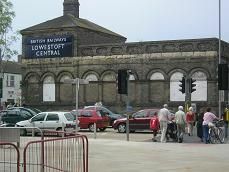 Trivia: Lowestoft railway station is the most easterly station in the whole of Britain. 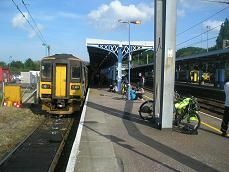 Description: A single-track branch line on the outer edges of London. It links the Great Eastern mainline out of Liverpool Street with the Fenchurch Street to Southend line. The track is surrounded for much of its route by suburban housing, with the occasional swathe of greenery. History: This branch line was originally opened in June 1893 by the London, Tilbury & Southend Railway Company. It was electrified in the 1980's. 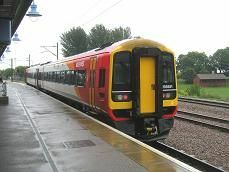 Description: This line passes through some of the flattest land in Britain, over the northern fens, which were once sea. History: The line from Boston to Louth was opened in 1848. 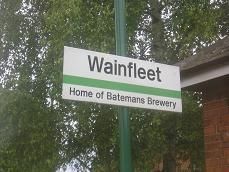 The line south from Boston to Grantham was opened in 1855 and the last section from Wainfleet to Skegness was first opened in 1873. 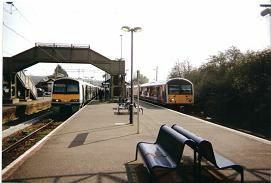 Description: This single-track line has grown in popularity in recent years with the growth of the Lakeside Retail Park west of Grays, whose station is the new Chafford Hundred station. The journey goes through the first piece of greenbelt to the east of London, but soon rejoins the urban landscape after Ockendon, as it comes into the Grays area. Through trains from Fenchurch Street to Southend via Tilbury now use this route, whereas before they used to start and terminate at Upminster, the start of London Transport's District line. Description: This branch line off the Liverpool Street to Southend Victoria line starts at the commuter town of Wickford, near Basildon and follows the valley of the River Crouch to Burnham-on-Sea, before turning north to the village of Southminster, not far from Bradwell nuclear power station. History: The first stage of this line was the opening of the railway to Burnham which was completed in 1889. 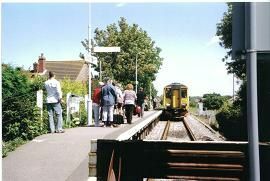 Due to the area north of Burnham being rich in sand deposits the line to Southminster was opened a few years later. The line was electrified in 1986. Description: The line leaves the Great Eastern Mainline at Witham and travels in a north westerly direction, parallel with Pod's Brook, a tributary of the Blackwater. 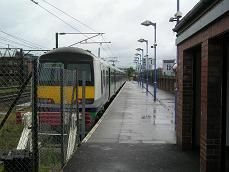 It terminates at Braintree, a town situated half way between Bishop's Stortford and Colchester. 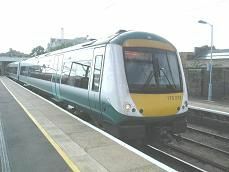 History: The line was originally opened in 1869 running east from Bishops Stortford via Braintree to Witham. The line west of Braintree closed in 1969. The line was electrified in 1977, allowing through trains to run from Liverpool Street.